HALF the world, it is said, knows not how the other half live. Our Exploring Expedition saw the Feejee islanders getting their dinner off human bones; and they are said to eat their own wives and children. The husbandry of the modern inhabitants of Gournou (west of old Thebes) is philosophical to a fault. To set up their housekeeping nothing is requisite but two or three earthen pots, a stone to grind meal, and a mat which is the bed. The house, namely a tomb, is ready without rent or taxes. No rain can pass through the roof, and there is no door, for there is no want of one, as there is nothing to lose. If the house do not please them, they walk out and enter another, as there are several hundreds at their command. “It is somewhat singular,” adds Belzoni, to whom we owe this account, “to talk of happiness among people who live in sepulchres, among the corpses and rags of an ancient nation which they know nothing of.” In the deserts of Borgoo the rock-Tibboos still dwell in caves, like cliff-swallows, and the language of these negroes is compared by their neighbors to the shrieking of bats and to the whistling of birds. Again, the Bornoos have no proper names; individuals are called after their height, thickness, or other accidental quality, and have nicknames merely. But the salt, the dates, the ivory, and the gold, for which these horrible regions are visited, find their way into countries where the purchaser and consumer can hardly be ranked in one race with these cannibals and man-stealers; countries where man serves himself with metals, wood, stone, glass, gum, cotton, silk, and wool; honors himself with architecture; writes laws, and contrives to execute his will through the hands of many nations; and, especially, establishes a select society, running through all the countries of intelligent men, a self-constituted aristocracy, or fraternity of the best, which, without written law or exact usage of any kind, perpetuates itself, colonizes every new-planted island and adopts and makes its own whatever personal beauty or extraordinary native endowment anywhere appears. What fact more conspicuous in modern history than the creation of the gentleman? Chivalry is that, and loyalty is that, and, in English literature, half the drama, and all the novels, from Sir Philip Sidney to Sir Walter Scott, paint this figure. The word gentleman, which, like the word Christian, must hereafter characterize the present and the few preceding centuries by the importance attached to it, is a homage to personal and incommunicable properties. Frivolous and fantastic additions have got associated with the name, but the steady interest of mankind in it must be attributed to the valuable properties which it designates. An element which unites all the most forcible persons of every country; makes them intelligible and agreeable to each other, and is somewhat so precise that it is at once felt if an individual lack the masonic sign, cannot be any casual product, but must be an average result of the character and faculties universally found in men. It seems a certain permanent average; as the atmosphere is a permanent composition, whilst so many gases are combined only to be decompounded. Comme il faut, is the Frenchman’s description of good Society: as we must be. It is a spontaneous fruit of talents and feelings of precisely that class who have most vigor, who take the lead in the world of this hour, and though far from pure, far from constituting the gladdest and highest tone of human feeling, is as good as the whole society permits it to be. It is made of the spirit, more than of the talent of men, and is a compound result into which every great force enters as an ingredient, namely virtue, wit, beauty, wealth, and power. There is something equivocal in all the words in use to express the excellence of manners and social cultivation, because the quantities are fluxional, and the last effect is assumed by the senses as the cause. The word gentleman has not any correlative abstract to express the quality. Gentility is mean, and gentilesse is obsolete. But we must keep alive in the vernacular the distinction between fashion, a word of narrow and often sinister meaning, and the heroic character which the gentleman imports. The usual words, however, must be respected; they will be found to contain the root of the matter. The point of distinction in all this class of names, as courtesy, chivalry, fashion, and the like, is that the flower and fruit, not the grain of the tree, are contemplated. It is beauty which is the aim this time, and not worth. The result is now in question, although our words intimate well enough the popular feeling that the appearance supposes a substance. The gentleman is a man of truth, lord of his own actions, and expressing that lordship in his behavior, not in any manner dependent and servile, either on persons, or opinions, or possessions. Beyond this fact of truth and real force, the word denotes good-nature or benevolence: manhood first, and then gentleness. The popular notion certainly adds a condition of ease and fortune; but that is a natural result of personal force and love, that they should possess and dispense the goods of the world. In times of violence, every eminent person must fall in with many opportunities to approve his stoutness and worth; therefore every man’s name that emerged at all from the mass in the feudal ages, rattles in our ear like a flourish of trumpets. But personal force never goes out of fashion. That is still paramount to-day, and in the moving crowd of good society the men of valor and reality are known and rise to their natural place. The competition is transferred from war to politics and trade, but the personal force appears readily enough in these new arenas. Power first, or no leading class. In politics and in trade, bruisers and pirates are of better promise than talkers and clerks. God knows that all sorts of gentlemen knock at the door; but whenever used in strictness and with any emphasis, the name will be found to point at original energy. It describes a man standing in his own right and working after untaught methods. In a good lord there must first be a good animal, at least to the extent of yielding the incomparable advantage of animal spirits. The ruling class must have more, but they must have these, giving in every company the sense of power, which makes things easy to be done which daunt the wise. The society of the energetic class, in their friendly and festive meetings, is full of courage and of attempts which intimidate the pale scholar. The courage which girls exhibit is like a battle of Lundy’s Lane, or a sea- fight. The intellect relies on memory to make some supplies to face these extemporaneous squadrons. But memory is a base mendicant with basket and badge, in the presence of these sudden masters. The rulers of society must be up to the work of the world, and equal to their versatile office: men of the right Caesarian pattern, who have great range of affinity. I am far from believing the timid maxim of Lord Falkland ("that for ceremony there must go two to it; since a bold fellow will go through the cunningest forms”), and am of opinion that the gentleman is the bold fellow whose forms are not to be broken through; and only that plenteous nature is rightful master which is the complement of whatever person it converses with. My gentleman gives the law where he is; he will outpray saints in chapel, outgeneral veterans in the field, and outshine all courtesy in the hall. He is good company for pirates and good with academicians; so that it is useless to fortify yourself against him; he has the private entrance to all minds, and I could as easily exclude myself, as him. The famous gentlemen of Asia and Europe have been of this strong type; Saladin, Sapor, the Cid, Julius Caesar, Scipio, Alexander, Pericles, and the lordliest personages. They sat very carelessly in their chairs, and were too excellent themselves, to value any condition at a high rate. A plentiful fortune is reckoned necessary, in the popular judgment, to the completion of this man of the world; and it is a material deputy which walks through the dance which the first has led. Money is not essential, but this wide affinity is, which transcends the habits of clique and caste and makes itself felt by men of all classes. If the aristocrat is only valid in fashionable circles and not with truckmen, he will never be a leader in fashion; and if the man of the people cannot speak on equal terms with the gentleman, so that the gentleman shall perceive that he is already really of his own order, he is not to be feared. Diogenes, Socrates, and Epaminondas, are gentlemen of the best blood who have chosen the condition of poverty when that of wealth was equally open to them. I use these old names, but the men I speak of are my contemporaries. Fortune will not supply to every generation one of these well- appointed knights, but every collection of men furnishes some example of the class; and the politics of this country, and the trade of every town, are controlled by these hardy and irresponsible doers, who have invention to take the lead, and a broad sympathy which puts them in fellowship with crowds, and makes their action popular. The manners of this class are observed and caught with devotion by men of taste. The association of these masters with each other and with men intelligent of their merits, is mutually agreeable and stimulating. The good forms, the happiest expressions of each, are repeated and adopted. By swift consent everything superfluous is dropped, everything graceful is renewed. Fine manners show themselves formidable to the uncultivated man. They are a subtler science of defence to parry and intimidate; but once matched by the skill of the other party, they drop the point of the sword, points and fences disappear, and the youth finds himself in a more transparent atmosphere, wherein life is a less troublesome game, and not a misunderstanding rises between the players. Manners aim to facilitate life, to get rid of impediments and bring the man pure to energize. They aid our dealing and conversation as a railway aids travelling, by getting rid of all avoidable obstructions of the road and leaving nothing to be conquered but pure space. These forms very soon become fixed, and a fine sense of propriety is cultivated with the more heed that it becomes a badge of social and civil distinctions. Thus grows up Fashion, an equivocal semblance, the most puissant, the most fantastic and frivolous, the most feared and followed, and which morals and violence assault in vain. There exists a strict relation between the class of power and the exclusive and polished circles. The last are always filled or filling from the first. The strong men usually give some allowance even to the petulances of fashion, for that affinity they find in it. Napoleon, child of the revolution, destroyer of the old noblesse, never ceased to court the Faubourg St. Germain; doubtless with the feeling that fashion is a homage to men of his stamp. Fashion, though in a strange way, represents all manly virtue. It is virtue gone to seed: it is a kind of posthumous honor. It does not often caress the great, but the children of the great: it is a hall of the Past. It usually sets its face against the great of this hour. Great men are not commonly in its halls; they are absent in the field: they are working, not triumphing. Fashion is made up of their children; of those who through the value and virtue of somebody, have acquired lustre to their name, marks of distinction, means of cultivation and generosity, and, in their physical organization a certain health and excellence which secures to them, if not the highest power to work, yet high power to enjoy. The class of power, the working heroes, the Cortez, the Nelson, the Napoleon, see that this is the festivity and permanent celebration of such as they; that fashion is funded talent; is Mexico, Marengo, and Trafalgar beaten out thin; that the brilliant names of fashion run back to just such busy names as their own, fifty or sixty years ago. They are the sowers, their sons shall be the reapers, and their sons, in the ordinary course of things, must yield the possession of the harvest to new competitors with keener eyes and stronger frames. The city is recruited from the country. In the year 1805, it is said, every legitimate monarch in Europe was imbecile. The city would have died out, rotted, and exploded, long ago, but that it was reinforced from the fields. It is only country which came to town day before yesterday that is city and court today. Aristocracy and fashion are certain inevitable results. These mutual selections are indestructible. If they provoke anger in the least favored class, and the excluded majority revenge themselves on the excluding minority by the strong hand and kill them, at once a new class finds itself at the top, as certainly as cream rises in a bowl of milk: and if the people should destroy class after class, until two men only were left, one of these would be the leader and would be involuntarily served and copied by the other. You may keep this minority out of sight and out of mind, but it is tenacious of life, and is one of the estates of the realm. I am the more struck with this tenacity, when I see its work. It respects the administration of such unimportant matters, that we should not look for any durability in its rule. We sometimes meet men under some strong moral influence, as a patriotic, a literary, a religious movement, and feel that the moral sentiment rules man and nature. We think all other distinctions and ties will be slight and fugitive, this of caste or fashion for example; yet come from year to year and see how permanent that is, in this Boston or New York life of man, where too it has not the least countenance from the law of the land. Not in Egypt or in India a firmer or more impassable line. Here are associations whose ties go over and under and through it, a meeting of merchants, a military corps, a college class, a fire-club, a professional association, a political, a religious convention;the persons seem to draw inseparably near; yet, that assembly once dispersed, its members will not in the year meet again. Each returns to his degree in the scale of good society, porcelain remains porcelain, and earthen earthen. The objects of fashion may be frivolous, or fashion may be objectless, but the nature of this union and selection can be neither frivolous nor accidental. Each man’s rank in that perfect graduation depends on some symmetry in his structure or some agreement in his structure to the symmetry of society. Its doors unbar instantaneously to a natural claim of their own kind. A natural gentleman finds his way in, and will keep the oldest patrician out who has lost his intrinsic rank. Fashion understands itself; good-breeding and personal superiority of whatever country readily fraternize with those of every other. The chiefs of savage tribes have distinguished themselves in London and Paris, by the purity of their tournure. To say what good of fashion we can, it rests on reality, and hates nothing so much as pretenders; to exclude and mystify pretenders and send them into everlasting ’Coventry,’ is its delight. We contemn in turn every other gift of men of the world; but the habit even in little and the least matters of not appealing to any but our own sense of propriety, constitutes the foundation of all chivalry. There is almost no kind of self-reliance, so it be sane and proportioned, which fashion does not occasionally adopt and give it the freedom of its saloons. A sainted soul is always elegant, and, if it will, passes unchallenged into the most guarded ring. But so will Jock the teamster pass, in some crisis that brings him thither, and find favor, as long as his head is not giddy with the new circumstance, and the iron shoes do not wish to dance in waltzes and cotillons. For there is nothing settled in manners, but the laws of behavior yield to the energy of the individual. The maiden at her first ball, the country- man at a city dinner, believes that there is a ritual according to which every act and compliment must be performed, or the failing party must be cast out of this presence. Later they learn that good sense and character make their own forms every moment, and speak or abstain, take wine or refuse it, stay or go, sit in a chair or sprawl with children on the floor, or stand on their head, or what else soever, in a new and aboriginal way; and that strong will is always in fashion, let who will be unfashionable. All that fashion demands is composure and self-content. A circle of men perfectly well-bred would be a company of sensible persons in which every man’s native manners and character appeared. If the fashionist have not this quality, he is nothing. We are such lovers of self-reliance that we excuse in a man many sins if he will show us a complete satisfaction in his position, which asks no leave to be, of mine, or any man’s good opinion. But any deference to some eminent man or woman of the world, forfeits all privilege of nobility. He is an underling: I have nothing to do with him; I will speak with his master. A man should not go where he cannot carry his whole sphere or society with him,not bodily, the whole circle of his friends, but atmospherically. He should preserve in a new company the same attitude of mind and reality of relation which his daily associates draw him to, else he is shorn of his best beams, and will be an orphan in the merriest club. “If you could see Vich Ian Vohr with his tail on!” But Vich Ian Vohr must always carry his belongings in some fashion, if not added as honor, then severed as disgrace. There will always be in society certain persons who are mercuries of its approbation, and whose glance will at any time determine for the curious their standing in the world. These are the chamberlains of the lesser gods. Accept their coldness as an omen of grace with the loftier deities, and allow them all their privilege. They are clear in their office, nor could they be thus formidable without their own merits. But do not measure the importance of this class by their pretension, or imagine that a fop can be the dispenser of honor and shame. They pass also at their just rate; for how can they otherwise, in circles which exist as a sort of herald’s office for the sifting of character? As the first thing man requires of man is reality, so that appears in all the forms of society. We pointedly, and by name, introduce the parties to each other. Know you before all heaven and earth, that this is Andrew, and this is Gregory,they look each other in the eye; they grasp each other’s hand, to identify and signalize each other. It is a great satisfaction. A gentleman never dodges; his eyes look straight forward, and he assures the other party, first of all, that he has been met. For what is it that we seek, in so many visits and hospitalities? Is it your draperies, pictures, and decorations? Or do we not insatiably ask, Was a man in the house? I may easily go into a great household where there is much substance, excellent provision for comfort, luxury, and taste, and yet not encounter there any Amphitryon who shall subordinate these appendages. I may go into a cottage, and find a farmer who feels that he is the man I have come to see, and fronts me accordingly. It was therefore a very natural point of old feudal etiquette that a gentleman who received a visit, though it were of his sovereign, should not leave his roof, but should wait his arrival at the door of his house. No house, though it were the Tuileries or the Escurial, is good for anything without a master. And yet we are not often gratified by this hospitality. Every body we know surrounds himself with a fine house, fine books, conservatory, gardens, equipage and all manner of toys, as screens to interpose between himself and his guest. Does it not seem as if man was of a very sly, elusive nature, and dreaded nothing so much as a full rencontre front to front with his fellow? It were unmerciful, I know, quite to abolish the use of these screens, which are of eminent convenience, whether the guest is too great or too little. We call together many friends who keep each other in play, or by luxuries and ornaments we amuse the young people, and guard our retirement. Or if perchance a searching realist comes to our gate, before whose eye we have no care to stand, then again we run to our curtain, and hide ourselves as Adam at the voice of the Lord God in the garden. Cardinal Caprara, the Pope’s legate at Paris, defended himself from the glances of Napoleon by an immense pair of green spectacles. Napoleon remarked them, and speedily managed to rally them off: and yet Napoleon, in his turn, was not great enough with eight hundred thousand troops at his back, to face a pair of freeborn eyes, but fenced himself with etiquette and within triple barriers of reserve; and, as all the world knows from Madame de Stael, was wont, when he found himself observed, to discharge his face of all expression. But emperors and rich men are by no means the most skilful masters of good manners. No rentroll nor army-list can dignify skulking and dissimulation; and the first point of courtesy must always be truth, as really all the forms of good-breeding point that way. I have just been reading, in Mr. Hazlitt’s translation, Montaigne’s account of his journey into Italy, and am struck with nothing more agreeably than the self- respecting fashions of the time. His arrival in each place, the arrival of a gentleman of France, is an event of some consequence. Wherever he goes he pays a visit to whatever prince or gentleman of note resides upon his road, as a duty to himself and to civilization. When he leaves any house in which he has lodged for a few weeks, he causes his arms to be painted and hung up as a perpetual sign to the house, as was the custom of gentlemen. The complement of this graceful self-respect, and that of all the points of good breeding I most require and insist upon, is deference. I like that every chair should be a throne, and hold a king. I prefer a tendency to stateliness to an excess of fellowship. Let the incommunicable objects of nature and the metaphysical isolation of man teach us independence. Let us not be too much acquainted. I would have a man enter his house through a hall filled with heroic and sacred sculptures, that he might not want the hint of tranquillity and self-poise. We should meet each morning as from foreign countries, and, spending the day together, should depart at night, as into foreign countries. In all things I would have the island of a man inviolate. Let us sit apart as the gods, talking from peak to peak all round Olympus. No degree of affection need invade this religion. This is myrrh and rosemary to keep the other sweet. Lovers Should guard their strangeness. If they forgive too much, all slides into confusion and meanness. It is easy to push this deference to a Chinese etiquette; but coolness and absence of heat and haste indicate fine qualities. A gentleman makes no noise; a lady is serene. Proportionate is our disgust at those invaders who fill a studious house with blast and running, to secure some paltry convenience. Not less I dislike a low sympathy of each with his neighbor’s needs. Must we have a good understanding with one another’s palates? as foolish people who have lived long together know when each wants salt or sugar. I pray my companion, if he wishes for bread, to ask me for bread, and if he wishes for sassafras or arsenic, to ask me for them, and not to hold out his plate as if I knew already. Every natural function can be dignified by deliberation and privacy. Let us leave hurry to slaves. The compliments and ceremonies of our breeding should signify, however remotely, the recollection of the grandeur of our destiny. The flower of courtesy does not very well bide handling, but if we dare to open another leaf and explore what parts go to its conformation, we shall find also an intellectual quality. To the leaders of men, the brain as well as the flesh and the heart must furnish a proportion. Defect in manners is usually the defect of fine perceptions. Men are too coarsely made for the delicacy of beautiful carriage and customs. It is not quite sufficient to good- breeding, a union of kindness and independence. We imperatively require a perception of, and a homage to beauty in our companions. Other virtues are in request in the field and workyard, but a certain degree of taste is not to be spared in those we sit with. I could better eat with one who did not respect the truth or the laws than with a sloven and unpresentable person. Moral qualities rule the world, but at short distances the senses are despotic. The same discrimination of fit and fair runs out, if with less rigor, into all parts of life. The average spirit of the energetic class is good sense, acting under certain limitations and to certain ends. It entertains every natural gift. Social in its nature, it respects everything which tends to unite men. It delights in measure. The love of beauty is mainly the love of measure or proportion. The person who screams, or uses the superlative degree, or converses with heat, puts whole drawing-rooms to flight. If you wish to be loved, love measure. You must have genius or a prodigious usefulness if you will hide the want of measure. This perception comes in to polish and perfect the parts of the social instrument. Society will pardon much to genius and special gifts, but, being in its nature a convention, it loves what is conventional, or what belongs to coming together. That makes the good and bad of manners, namely what helps or hinders fellowship. For fashion is not good sense absolute, but relative; not good sense private, but good sense entertaining company. It hates corners and sharp points of character, hates quarrelsome, egotistical, solitary, and gloomy people; hates whatever can interfere with total blending of parties; whilst it values all peculiarities as in the highest degree refreshing, which can consist with good fellowship. And besides the general infusion of wit to heighten civility, the direct splendor of intellectual power is ever welcome in fine society as the costliest addition to its rule and its credit. The dry light must shine in to adorn our festival, but it must be tempered and shaded, or that will also offend. Accuracy is essential to beauty, and quick perceptions to politeness, but not too quick perceptions. One may be too punctual and too precise. He must leave the omniscience of business at the door, when he comes into the palace of beauty. Society loves creole natures, and sleepy languishing manners, so that they cover sense, grace and good-will: the air of drowsy strength, which disarms criticism; perhaps because such a person seems to reserve himself for the best of the game, and not spend himself on surfaces; an ignoring eye, which does not see the annoyances, shifts, and inconveniences that cloud the brow and smother the voice of the sensitive. We may easily seem ridiculous in our eulogy of courtesy, whenever we insist on benevolence as its foundation. The painted phantasm Fashion rises to cast a species of derision on what we say. But I will neither be driven from some allowance to Fashion as a symbolic institution, nor from the belief that love is the basis of courtesy. We must obtain that, if we can; but by all means we must affirm this. Life owes much of its spirit to these sharp contrasts. Fashion, which affects to be honor, is often, in all men’s experience, only a ballroom- code. Yet so long as it is the highest circle in the imagination of the best heads on the planet, there is something necessary and excellent in it; for it is not to be supposed that men have agreed to be the dupes of anything preposterous; and the respect which these mysteries inspire in the most rude and sylvan characters, and the curiosity with which details of high life are read, betray the universality of the love of cultivated manners. I know that a comic disparity would be felt, if we should enter the acknowledged ’first circles’ and apply these terrific standards of justice, beauty, and benefit to the individuals actually found there. Monarchs and heroes, sages and lovers, these gallants are not. Fashion has many classes and many rules of probation and admission, and not the best alone. There is not only the right of conquest, which genius pretends,the individual demonstrating his natural aristocracy best of the best; but less claims will pass for the time; for Fashion loves lions, and points like Circe to her horned company. This gentleman is this afternoon arrived from Denmark; and that is my Lord Ride, who came yesterday from Bagdat; here is Captain Friese, from Cape Turnagain; and Captain Symmes, from the interior of the earth; and Monsieur Jovaire, who came down this morning in a balloon; Mr. Hobnail, the reformer; and Reverend Jul Bat, who has converted the whole torrid zone in his Sunday school; and Signor Torre del Greco, who extinguished Vesuvius by pouring into it the Bay of Naples; Spahi, the Persian ambassador; and Tul Wil Shan, the exiled nabob of Nepaul, whose saddle is the new moon.But these are monsters of one day, and to-morrow will be dismissed to their holes and dens; for in these rooms every chair is waited for. The artist, the scholar, and, in general, the clerisy, wins their way up into these places and get represented here, somewhat on this footing of conquest. Another mode is to pass through all the degrees, spending a year and a day in St. Michael’s Square, being steeped in Cologne water, and perfumed, and dined, and introduced, and properly grounded in all the biography and politics and anecdotes of the boudoirs. Therefore, within the ethnical circle of good society there is a narrower and higher circle, concentration of its light, and flower of courtesy, to which there is always a tacit appeal of pride and reference, as to its inner and imperial court; the parliament of love and chivalry. And this is constituted of those persons in whom heroic dispositions are native; with the love of beauty, the delight in society, and the power to embellish the passing day. If the individuals who compose the purest circles of aristocracy in Europe, the guarded blood of centuries, should pass in review, in such manner as that we could at leisure and critically inspect their behavior, we might find no gentleman and no lady; for although excellent specimens of courtesy and high-breeding would gratify us in the assemblage, in the particulars we should detect offence. Because elegance comes of no breeding, but of birth. There must be romance of character, or the most fastidious exclusion of impertinencies will not avail. It must be genius which takes that direction: it must be not courteous, but courtesy. High behavior is as rare in fiction as it is in fact. Scott is praised for the fidelity with which he painted the demeanor and conversation of the superior classes. Certainly, kings and queens, nobles and great ladies, had some right to complain of the absurdity that had been put in their mouths before the days of Waverley; but neither does Scott’s dialogue bear criticism. His lords brave each other in smart epigramatic speeches, but the dialogue is in costume, and does not please on the second reading: it is not warm with life. In Shakspeare alone the speakers do not strut and bridle, the dialogue is easily great, and he adds to so many titles that of being the best-bred man in England and in Christendom. Once or twice in a lifetime we are permitted to enjoy the charm of noble manners, in the presence of a man or woman who have no bar in their nature, but whose character emanates freely in their word and gesture. A beautiful form is better than a beautiful face; a beautiful behavior is better than a beautiful form: it gives a higher pleasure than statues or pictures; it is the finest of the fine arts. A man is but a little thing in the midst of the objects of nature, yet, by the moral quality radiating from his countenance he may abolish all considerations of magnitude, and in his manners equal the majesty of the world. I have seen an individual whose manners, though wholly within the conventions of elegant society, were never learned there, but were original and commanding and held out protection and prosperity; one who did not need the aid of a court-suit, but carried the holiday in his eye; who exhilarated the fancy by flinging wide the doors of new modes of existence; who shook off the captivity of etiquette, with happy, spirited bearing, good-natured and free as Robin Hood; yet with the port of an emperor, if need be,calm, serious, and fit to stand the gaze of millions. The open air and the fields, the street and public chambers are the places where Man executes his will; let him yield or divide the sceptre at the door of the house. Woman, with her instinct of behavior, instantly detects in man a love of trifles, any coldness or imbecility, or, in short, any want of that large, flowing, and magnanimous deportment which is indispensable as an exterior in the hall. Our American institutions have been friendly to her, and at this moment I esteem it a chief felicity of this country, that it excels in women. A certain awkward consciousness of inferiority in the men may give rise to the new chivalry in behalf of Woman’s Rights. Certainly let her be as much better placed in the laws and in social forms as the most zealous reformer can ask, but I confide so entirely in her inspiring and musical nature, that I believe only herself can show us how she shall be served. The wonderful generosity of her sentiments raises her at times into heroical and godlike regions, and verifies the pictures of Minerva, Juno, or Polymnia; and by the firmness with which she treads her upward path, she convinces the coarsest calculators that another road exists than that which their feet know. But besides those who make good in our imagination the place of muses and of Delphic Sibyls, are there not women who fill our vase with wine and roses to the brim, so that the wine runs over and fills the house with perfume; who inspire us with courtesy; who unloose our tongues and we speak; who anoint our eyes and we see? We say things we never thought to have said; for once, our walls of habitual reserve vanished and left us at large; we were children playing with children in a wide field of flowers. Steep us, we cried, in these influences, for days, for weeks, and we shall be sunny poets and will write out in many-colored words the romance that you are. Was it Hafiz or Firdousi that said of his Persian Lilla, She was an elemental force, and astonished me by her amount of life, when I saw her day after day radiating, every instant, redundant joy and grace on all around her. She was a solvent powerful to reconcile all heterogeneous persons into one society: like air or water, an element of such a great range of affinities that it combines readily with a thousand substances. Where she is present all others will be more than they are wont. She was a unit and whole, so that whatsoever she did, became her. She had too much sympathy and desire to please, than that you could say her manners were marked with dignity, yet no princess could surpass her clear and erect demeanor on each occasion. She did not study the Persian grammar, nor the books of the seven poets, but all the poems of the seven seemed to be written upon her. For though the bias of her nature was not to thought, but to sympathy, yet was she so perfect in her own nature as to meet intellectual persons by the fulness of her heart, warming them by her sentiments; believing, as she did, that by dealing nobly with all, all would show themselves noble. I know that this Byzantine pile of chivalry or Fashion, which seems so fair and picturesque to those who look at the contemporary facts for science or for entertainment, is not equally pleasant to all spectators. The constitution of our society makes it a giant’s castle to the ambitious youth who have not found their names enrolled in its Golden Book, and whom it has excluded from its coveted honors and privileges. They have yet to learn that its seeming grandeur is shadowy and relative: it is great by their allowance; its proudest gates will fly open at the approach of their courage and virtue. For the present distress, however, of those who are predisposed to suffer from the tyrannies of this caprice, there are easy remedies. To remove your residence a couple of miles, or at most four, will commonly relieve the most extreme susceptibility. For the advantages which fashion values are plants which thrive in very confined localities, in a few streets namely. Out of this precinct they go for nothing; are of no use in the farm, in the forest, in the market, in war, in the nuptial society, in the literary or scientific circle, at sea, in friendship, in the heaven of thought or virtue. But we have lingered long enough in these painted courts. The worth of the thing signified must vindicate our taste for the emblem. Everything that is called fashion and courtesy humbles itself before the cause and fountain of honor, creator of titles and dignities, namely the heart of love. This is the royal blood, this the fire, which, in all countries and contingencies, will work after its kind and conquer and expand all that approaches it. This gives new meanings to every fact. This impoverishes the rich, suffering no grandeur but its own. What is rich? Are you rich enough to help anybody? to succor the unfashionable and the eccentric? rich enough to make the Canadian in his wagon, the itinerant with his consul’s paper which commends him “To the charitable," the swarthy Italian with his few broken words of English, the lame pauper hunted by overseers from town to town, even the poor insane or besotted wreck of man or woman, feel the noble exception of your presence and your house from the general bleakness and stoniness; to make such feel that they were greeted with a voice which made them both remember and hope? What is vulgar but to refuse the claim on acute and conclusive reasons? What is gentle, but to allow it, and give their heart and yours one holiday from the national caution? Without the rich heart, wealth is an ugly beggar. The king of Schiraz could not afford to be so bountiful as the poor Osman who dwelt at his gate. Osman had a humanity so broad and deep that although his speech was so bold and free with the Koran as to disgust all the dervishes, yet was there never a poor outcast, eccentric, or insane man, some fool who had cut off his beard, or who had been mutilated under a vow, or had a pet madness in his brain, but fled at once to him; that great heart lay there so sunny and hospitable in the centre of the country, that it seemed as if the instinct of all sufferers drew them to his side. And the madness which he harbored he did not share. Is not this to be rich? this only to be rightly rich? Interested to buy a book? 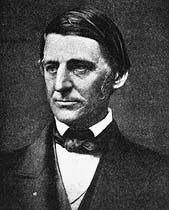 Ralph Waldo Emerson: Essays and Lectures.